Happy halloween ! It`s time to prepare the Jack-O-Lanterns ! A set of professional pumpkin carving tools to help you easily carve great pieces.Enjoy it with your families,classmates or friends ! ✔The Etching Tool - Create designs as simple names, numbers, eyebrows with ease, Makes even an amateur pumpkin carver look like a pro. ✔The Pumpkin Scooper - Fantastic for scoruing out pumpkin guts cleanly and quickly. ✔The Saw - Strong enough for tight corners and lines, easily to carver cuts out patterns and lids. ✔The Poker - Pointy enough to do very fine detail and cleanup work, perfect handle length for easy handling. The 20 Pcs Pumpkin Carved Stencils - Various choices allow you to enjoy the fun of carving. ➊ Please use these knives carefully to avoid injury. ➋ Stencils can be discarded after use. ➊ If you have any questions about this product, please leave a message on this page. Our service manage will reply them. ➋ If the product you received were defective, please contact us for refund. 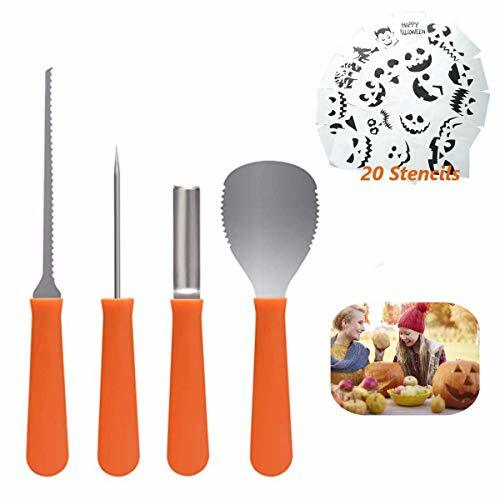 【Professional and Ergonomically】Specifically designed for carving halloween pumpkins,handy and easy to use,save your time and make it easy for you or even children to carve excellent pumpkin lanterns.Enjoy the carving fun with families ! Manufacturer: Shenzhen Auxin Technology Co., Ltd. Publisher: Shenzhen Auxin Technology Co., Ltd. Studio: Shenzhen Auxin Technology Co., Ltd. If you have any questions about this product by AUXIN, contact us by completing and submitting the form below. If you are looking for a specif part number, please include it with your message.